Hematoporphyrine derivatives are considered with an efficient agents for photosensitive therapy. Systemically or topically administered, Photosan 3 (PS 3) and meso-tetra-para-sulfonatophenylporphine dodecahydrate tetra sodium salt (TPPS4) are being recognized as a photosensitive hematoporphyrine derivatives highly attacking the immature tissues (e.g. tumors, embryonic organ primordia and primitive vessels). All these porphyrine photosensitizers are able to support a production of the toxic singled oxygen destroying the photosensitizer-filled tissue after coherent light irradiation. Exogenously applied porphyrine derivatives significantly increase long-lasting photosensitivity of treated tissues (e.g. skin) as a side effect. Using chicken embryo model we are examining in this study relation between various porphyrine compounds and host tissues even before light exposure and relative affinity to organ primordia and vascularized tumor transplant after systemic administration. Do they exert some embryotoxic influence on the growing tissues after exogenous administration ? Which anomalies, if any, can be observed after photosensitizer application ? Since the pharmacodynamic fate of PS 3 and TPPS4, in the organism after exogenous administration is not fully understood, the effect of all these compounds was studied in vivo in the chicken embryo. The Chicken Embryotoxicity Screening Test was used to estimate the beginning of of the embryotoxicity dose range. 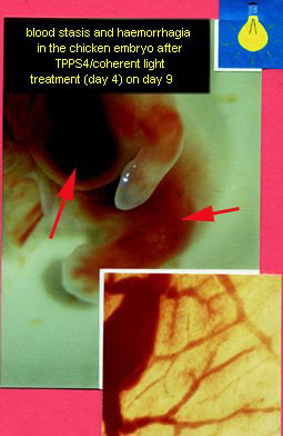 TPPS4 or PS 3 dissolved in the distilled water were injected subgerminally or intraamniotically on days 3 to 5 (either 3ml or 10ml) to the chicken embryo (0,3 to 300 mg per embryo) in single doses 3, 10 ml). This is the time in which organ primordia are extremely sensitive for exogenous chemical treatment. 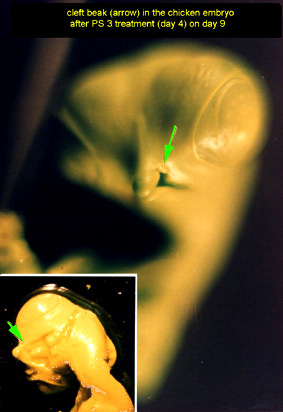 On reaching day 9-10 the embryos were collected, weighted, and all embryos were examined using stereomicroscope (Wild M 420, Leitz, Swiss). Gross dose-response relationships were established by summing up the dead and living malformed embryos for each dose and day of administration. The beginning of the embryotoxicity range was determined as lying between the doses where the dose-response curve crossed the nonspecific effect level. The nonspecific level constitutes the maximal background frequency of malformed and dead control embryos that occurs spontaneously and/or is induced by experimental intervention itself. 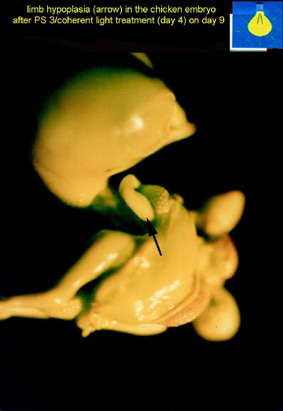 PS 3 and TPPS4 penetrate to embryonic tissues in hours after intraamniotic administration. 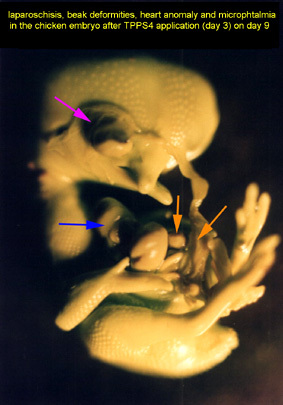 Accumulation of the PS 3 in tissues shows similar range of the specific developmental anomalies in comparison with the TPPS4. Supported Grant IGA UK 144/97 organized by Charles University administration.